A beautiful shift dress from Elena Miro in a sophisticated black and golden beige colour combination. 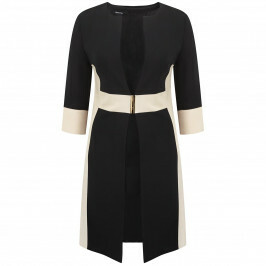 With flattering cropped sleeves it is the perfect desk-to-dinner dress in your wardrobe. Together with our matching long jacket you can create a stunning, polished ensemble ideal for any event. Black and golden beige shift dress with three-quarter sleeves. 60% Acetate 40% Viscose. Delicate machine wash.